As we approach the 21st century, there is a discernable shift in policing, from an incident-driven perspective to a proactive problem solving stance often described as "community policing." 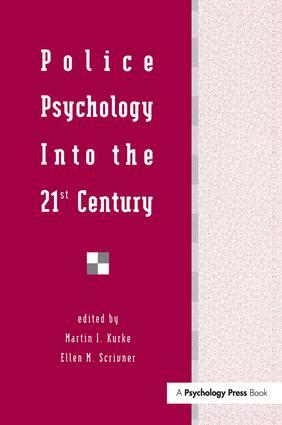 In this volume a panel of 21 psychologists examine the changing directions in policing and how such changes impact on psychological service delivery and operational support to law enforcement agencies. The book describes existing and emerging means of providing psychological support to the law enforcement community in response to police needs to accommodate new technology, community-oriented problem solving technology, crime prevention, and sensitivity to community social changes. Senior psychologists who are sworn officers, federal agents and civilian employees of federal, state and local law enforcement agencies comprise the team of chapter authors. Their perspectives encompass their collective experience "in the trenches" and in law enforcement management and administrative support roles. They discuss traditional applications of psychology to police selection, training and promotion processes, and in trauma stress management and evaluation of fitness for duty. Concerns related to police diversity and police family issues are also addressed, as are unique aspects of police stress management. Additional chapters are dedicated to establishing psychological service functions that currently are less familiar to police agencies than they are to other government and private sector service recipients. These chapters are devoted to police psychologists as human resource professionals, as human factors experts in accommodating to new technology and to new legal requirements, as organizational behavioral experts, and as strategic planners. *practicing and would-be police psychologists concerned with the emerging trends in the application of psychology to police and other public safety programs.